Gather everyone around the table and savour this comforting soup which has smells and taste that will keep that cold at bay, no matter how the weather is outside. 1. With an apple corer, small knife or spoon core the pears removing the seeds but trying to keep as much of pear intact as possible. Peel the pears and chop into small pieces. Peel the pumpkin and chop into small chunks. 2. Melt the butter in a large saucepan, add the onion and cook over low heat for 5 minutes, or until soft. 3. 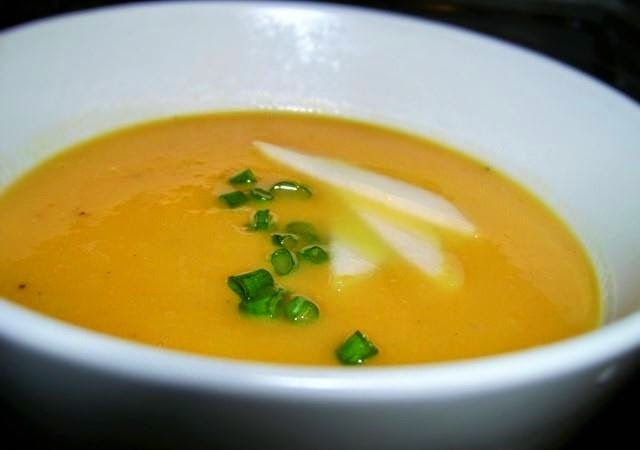 Add the cumin seeds and cook for another minute and then add the pumpkin and pear chunks with the vegetable stock, Increase the heat and bring to the boil, the reduce the heat and simmer for 2 minutes or until the the pumpkin and pears are soft. Remove from heat and allow to cool. 4. Blend in batches until smooth. Return to a cleaned pan and stir in the the cream and simmer until warmed through and season with salt and freshly ground black pepper. 5. Drizzle with some more cream and serve with a scattering of fresh chives if desired.